(um actually she is vadecarian lol) Mika nodded. "so...do you know much about ranching aaden?" she asked gently. I st down and Arora sat on my lap and cuddled in close. Sloan smiled back and scooted in closer. She found herself sitting near the other girl in the group, Mika. She felt herself tense up. ~Don't remind me of that dreadful place!~ Sloan yelled at Takyia. Takyia flattened her ears in frightness. ~Sorry.~ Takyia scooted backwards, laying behind Sloan. Mika felt a presence near her. "Hello?" she said softly "I can't see you..your going to have to talk.." she said gently. "I did a little bit back when I was doing odd jobs to get money." he replied. "It's not something I'm particularly good at though." he said and added, "I love horses though, they have much more quirky personalities then cows though." "Hello" Said arora to the new girl "I'm arora." Mika laughed "You should try herding buffulo. You want quirky personalities..oi" she giggled. She realized she hadn't laughed in a long time. She frowned slightly and listened again. "Oh I am sorry. I didn't know..." She swalloed hard. "My name is Sloan Allerion. 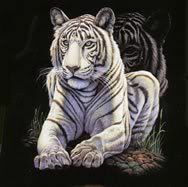 My white wolf, Takyia, is just behind me." She snapped her fingers for Takyia to come. She sat down next to Mika and licked her shoulder. "Takyia says 'Hello'." Sloan said gently. "She was hurt in a fall. She cant see now but she will get better." Arora put in gently. Mika smiled "Good to meet you." "Hi Takyia" she said softly. She whispered something in Lakota and the wolf cocked it's head at her. She just smiled slightly. "Hopefully I will see you soon" she said quietly in english again. He smiled to hear to her laugh, " I had a horse back in her hometown, he wouldn't move unless you turned your back on him and walked forward. The first time I handled him, I tugged her for about a half hour before I gave up and walked away, he decided to follow me then" he chuckled, remembering the smart little pony. I listened as all interacted. The sun was pretty much set when the roast was finished. I lifted the lid and everyone could smell it. Even my mouth was watering. "Anyone besides me hungry?" Sloan gave her a half smile and patted her hand. "I hope so." She looked over at Jarlon. "So...are you and Jarlon...together?" She asked, remembering the way he looked at Mika when she first came. I jumped up and yelped. "Me" My voice was huskey and dry. "Me!" he said and stood up, offering help to Mika. Mika smiled. "I had a horse back in Lakota territory that was fast as the wind. He was given to me when I was only 2 yrs old. He was only a colt at the time. We grew up together. His name was Kola" she smiled slightly remembering. But if he had been able to see her eyes he would have seen how sad she was. Mika looked up suprised at Sloan's question, "Just friends" she said quietly. Sloan smiled and patted Mika's hand again. "Aha ok." She looked over at the handsome Jarlon again. "Is he with anyone?" She went pale at the question. "I didn't mean to ask that!" She put her hands up and shook her head. He noticed the slight change in her voice, "Sounds nice..." he said and went silent, thinking but he couldn't help chuckling at Sloan. "He's single, right?" he asked Mika to confirm it. Salem smiled as he got Arora a drink. I used the big metal spoon and filled a wooden bowl for everyone with juices and onions, carrots and little potatoes. I then pulled my dagger from my hip and cut the roast and put a nice thick juicy chunk on everyones bowl. I then cut one up for Mika and set it on her lap. "It's dark out, shoud we try removing the wraps again?" I looked at her native face blue eyes sparkling in the fire. Sloan gladly accepted a bowl of soup with the meat. Takyia moved to sit next to Sloan. ~Sure you will...~ Takyia looked at her, mischeviously. Sloan hit her gently on the back. She chuckled. ~Don't start.~ Takyia jumped up and licked Jarlon's arm. ~Takyia! Don't EVEN do it!~ Sloan yelled at her wolf. "Hey there gorgeous" I smiled and ruffed her coat. "how about a big juicy bone" I said as I got up and went to the hide where parts still laid. I handed her a big juicy bone with some meat on it. "Enjoy"
Takyia gladly accepted the bone and returned to Sloan. She eyed her with laughter in her eyes. Takyia looked at her with confusion. ~Never mind.~ Sloan continued eating and looked over at Mika. "I think it would help, it'll give her some fresh air and a little time to use her eyes." he said, ~That stew sure looks good...~ Lyla said, climbing onto the bench next to him.